L Section Timing Belts. 3/8" Pitch Trapezoidal Tooth Gear belts. Home > Timing Belts MXL-XL-L-H... > L Timing Belts. 3/8" Pitch Trapezoidal Tooth Gear belts. L Timing Belts. 3/8" Pitch Trapezoidal Tooth Gear belts. L Section Timing belts have medium size teeth and are generally found in power equipment and tools such as sanders, woodworking tools & lathes, printing & sorting machines, pumps, and robotic equipment where heavier duty timing belts are required. "Trapezoidal" is used to describe the squared shape of the tooth profiles. 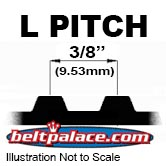 L Series belts are sized by Outer Circumference (Overall Length), Pitch Type, and Width. For example, a 18.7” Circumference "L" Timing belt 1/2” wide would be described “187L050” in Standard or Imperial units (-"050” would represent 0.50” or 1/2” width). A "G" suffix is occasionally used to further identify Neoprene belts (black rubber) and "U" for Polyurethane material (colored plastic). "UG" would designate Polyurethane with Fiberglas cord backing, if applicable. ALL BELTS ARE NEOPRENE CONSTRUCTION UNLESS NOTED OTHERWISE. We are currently updating these sections so many available belts may not appear. Please call if you don't see what you need. We will be happy to help! USA: (317) 519-9020, M-F, 7AM to 4PM EST. 150L050 TIMING BELT. Industrial Grade. 150L-050 Timing Belt. 15 inch Length, 3/8" (0.375) Inch pitch, 40 teeth. 1/2" Top Width. 150L050 TIMING BELT. 150L075 Industrial Timing Belt HTD. 3/8" Tooth Pitch, 40 Teeth, 15" Length, 3/4" wide. 150L100 TIMING BELT. Industrial grade BANDO Synchro-Link 150L-100. 40 Teeth, 15" Pitch - 1" width. • 165L100 Synchro Link Timing Belts: 1" Wide - 3/8" (.375"/L) Pitch. 44 teeth. 195L050 Industrial Timing Belt. 19.5” Length, 52 teeth, 1/2” Wide. Neoprene HTD 195L-050 Timing belt 195L-050. 225L100 TIMING BELT. 60 Teeth, 22.5" Length, 3/8" Pitch - 1" width. 300L050 Synchronous Timing Belt. 30" Length, 80 teeth, 3/8" Pitch. Trapezoidal tooth profile. 300L100 SynchroLink Timing Belt. 80 Teeth, 30" Length OC - 1" width. 322L050 BANDO INDUSTRIAL TIMING BELT (322L 050-G). 345L100 Bando Industrial Sycnhro-Link Timing belt. 92 Teeth, 34.5" Pitch Length x 1" width. 390L075 INDUSTRIAL GRADE Timing Belts: 39" L x 3/4" Wide - 3/8" (.375") Pitch. 104 Teeth, 39" Pitch Length - 3/4" width. 450L100 Industrial Grade Timing Belt. 45.0” Length, 120 teeth, 1” Wide. Neoprene HTD 450L-100 Timing belt 450L-100. 600L075-G BANDO SYNCHROLINK Timing Belt. 160 Teeth, 60" Pitch - 3/4" width. 660L075 TIMING BELT. Bando Synchrolink. 176 Teeth, 66" Pitch Length - 3/4" width. 817L050 Timing Belt: 81.75" L x 1/2" Wide, 218 Teeth. 3/8" Pitch. 817L-050.